Even if you have a snake phobia (like we do), you gotta admit that this venomous white cobra is a marvel to behold. The reptile was captured in September in Thousand Oaks, Calif. after apparently escaping from its never-located owner ... not suprising, since it's illegal to own a cobra without a permit in California. After an extended quarantine and a battery of physical tests, it's now available for admiring at the San Diego Zoo, the LA Times reports. The snake is female, about four feet long, and is around two years old. 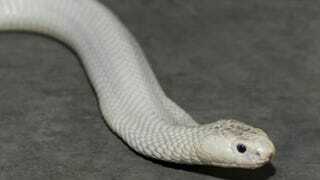 The snake is a monocled cobra, not an albino. The former has limited pigmentation; the latter has none. Zookeepers plan to monitor the cobra to make sure it is not becoming unnerved by being on display. Cobras have a tendency to be shy so visitors are advised to look closely under the rock ledge or beneath the plants. "We expect it may take her a few weeks to get used to her new surroundings," said zookeeper Rachael Walton. "Being a cobra, she likes to hide." Get in on the inevitable naming contest at the San Diego Zoo's adorably designed "Name the White Cobra" page, and choose between Adhira (lightning), Sapheda (white), Krima (cream), Cini (sugar), Moti (pearl), and Sundara (beautiful).